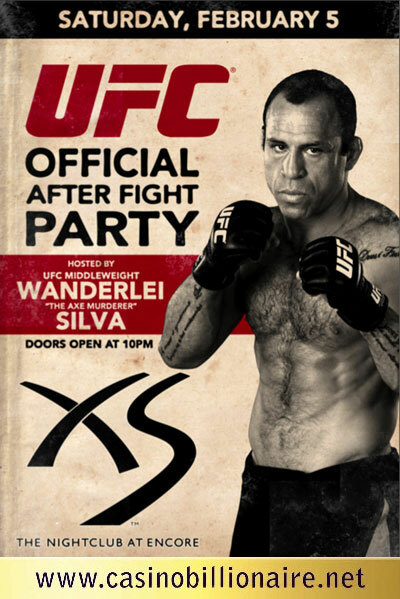 The UFC 126 official after party will be on Saturday, february 5 hosted by the UFC middleweight Wanderlei Silva (The Axe Murderer) at the XS Nightclub - Encore Hotel & Casino Las Vegas . Come have a drink and see both celebrities and fighters in this very special night. Private VIP area with celebrities and UFC fighters hosted by Wanderlei Silva. - COST: US$ 2500 including table, 2 bottles and tips. If you are interested in purchase your table, please scroll down and comment this post with your contact information ( name, email, phone). Our VIP concierge will contact you asap.